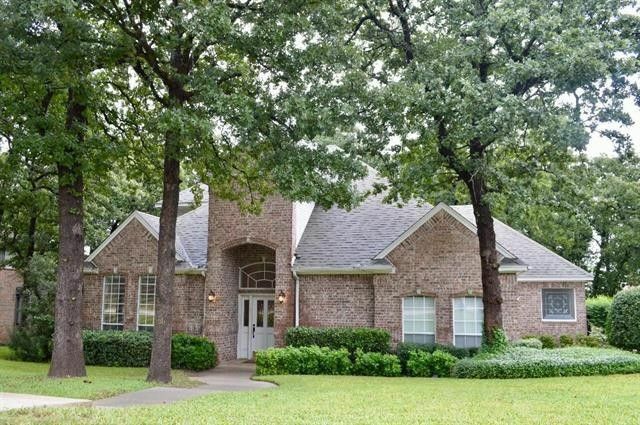 Surrounded by mature oak trees, this stunning brick custom home in Forrestridge has remarkable upgrades-- wood floors in the dining & in both living areas, granite countertops, new backsplash, travertine, & recently upgraded carpet & tile. The freshly resurfaced white 42 inch kitchen cabinets & new stainless steel appliances complement the spacious family room that is totally open to the breakfast area in a bay window bar & to the cutting edge kitchen. The secluded first floor master suite offers generous sitting area, a big customized walkin closet, 2 leaded glass windows that brighten the master bath & its ample counters, double sinks & storage.Upstairs, three guest bedrooms & big bath offer quiet privacy. Directions: NOTE:THE DEADLINE FOR BEST & FINAL OFFERS FOR THIS HOME ARE 7:00 PM WEDNESDAY, OCTOBER 24, 2018. PLEASE SUBMIT A COMPLETE OFFER & PREAPPROVAL LETTER. SEND TO LA. I 35E North, left on Teasley, right on Hobson, left on Forrestridge. Exclusions: decorative mirror, 2 stained glass pieces hanging at family room windows. Metal art work (staging items).